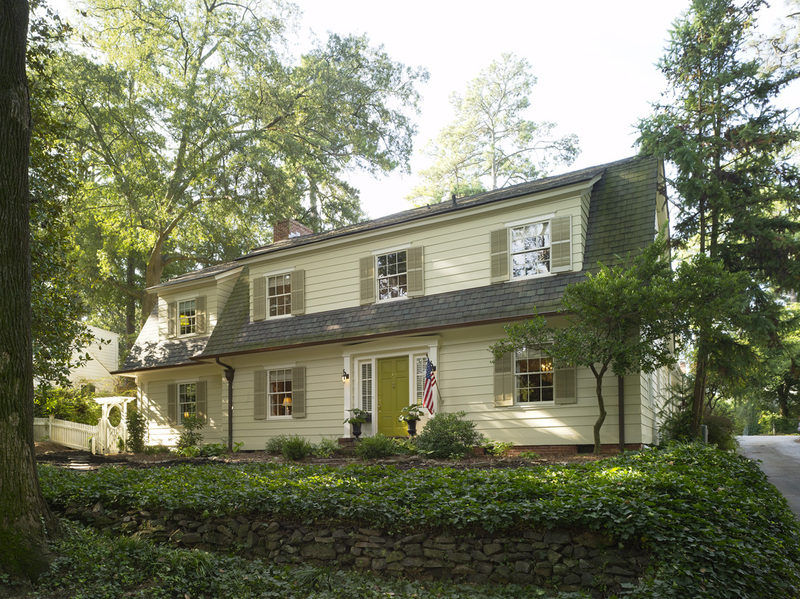 An Ansley Park home is remodeled with grace, humor and skill, thanks to the Cruickshank family. Brad Cruickshank with his dog, Pepper. If there’s one sector of business Atlanta is known nationwide for, it’s the home market and all that comes with it: real estate, interiors, architecture and remodeling. 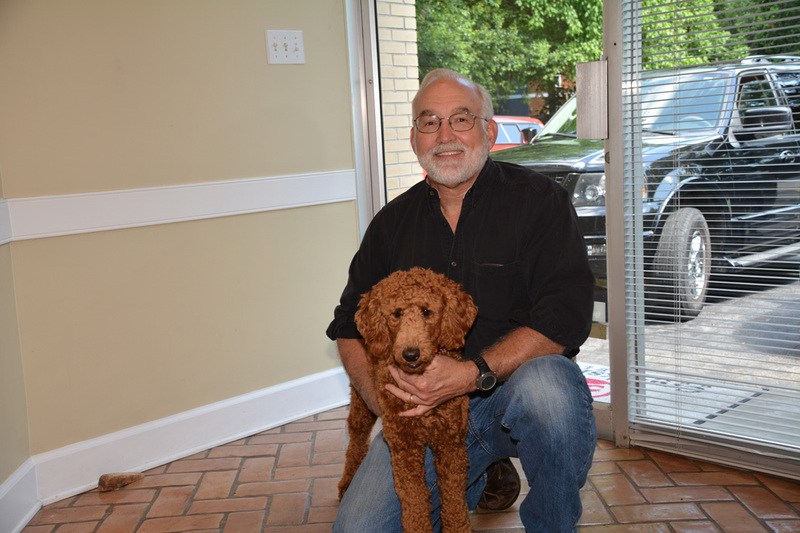 Brad Cruickshank is well known around Atlanta as the President of Cruickshank Remodeling; he’s also the chairman of the Atlanta Chapter of the National Association of the Remodeling Industry and has won countless awards for his remodeling work throughout the Atlanta area. But tackling his personal property proved to be slightly more intensive—and humorous—than he first imagined. 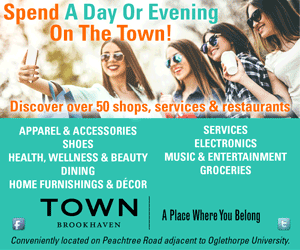 Cruickshank, together with his Atlanta-native wife, Cheryl, knew he needed to start looking for a bigger home when his second child was on her way in 1991. In May of that year, a neighbor Realtor hinted that a house was going up for sale in their existing neighborhood of Ansley Park, and the couple snatched the property up and moved their two young girls into the house to begin immediate renovations. The previous owner and his late wife were only the third generation to occupy the 1921 Dutch Colonial, and the Cruickshanks jumped at the chance to have a historic home in their current neighborhood— one of the most sought-after neighborhoods in the metro area. The exterior of the 1921 Dutch Colonial. 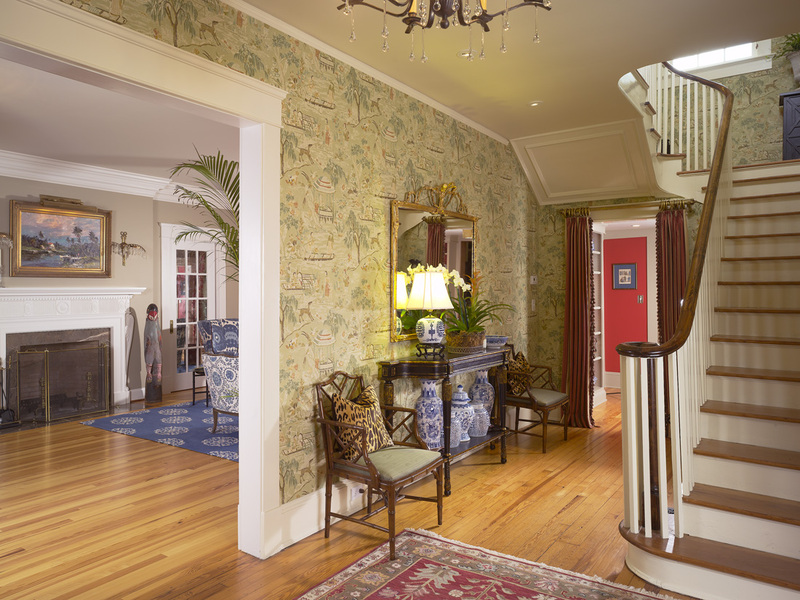 The Cruickshanks wanted to honor the history of the house but to also modernize it for a family of four. It proved to be quite the undertaking, given the eccentricities of the house’s current state. But the Cruickshanks saw an opportunity where others might have seen calamity. “It’s the kind of house I love to get because we weren’t going to pay for anyone’s poorly done remodel,” Cruickshank says with a chuckle. Glass walls at the rear of the house overlook the patio and afford views of the garden. The work involved three massive phases of renovations on the house, with an initial five-month remodel, an addition—Brad’s “nights and weekends project for several years, the family got tired of me banging away out there every Saturday and Sunday”— and then a heavy-duty third remodel. Print mixing factors into the design scheme of the home’s foyer. The second, years-long phase encompassed putting a sizable addition on the back of the property, including a family room, a first-floor bathroom, Cheryl’s home office, a guest room and a garage with a study over it. But that wasn’t as daunting as the eight-month-long third phase, which had the second story of the house propped up to rebuild the living room and dig out a new basement under the house and the addition. “Working out how to get the digging equipment into the house to dig it out, keeping water out of the house, keeping the master bedroom propped up—it was by far the hardest part of the project. The living room is the biggest room, and there was significant termite damage in the floor joists and not a lot of room to work underneath. I had to crawl in there and put some beams in for support. It got wearisome,” he admits. 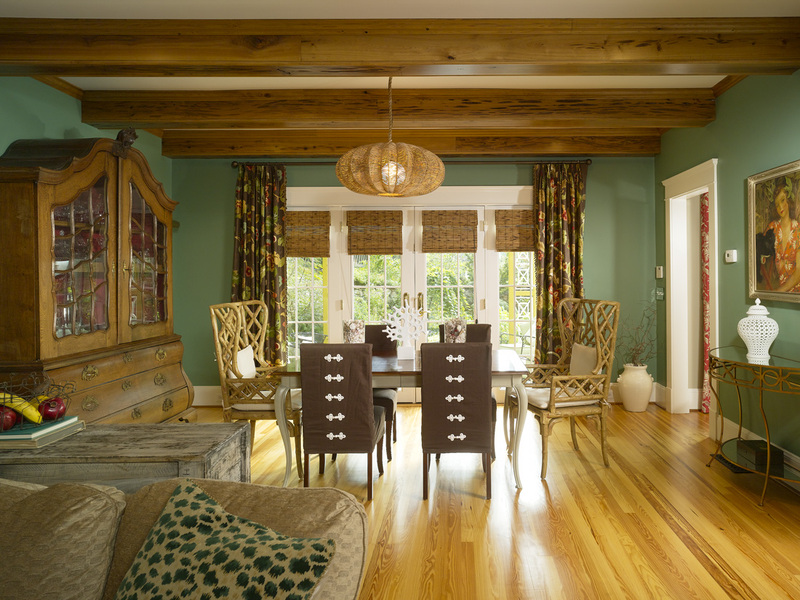 The use of natural wood and green paint is continued in a dining nook just off of the family room. 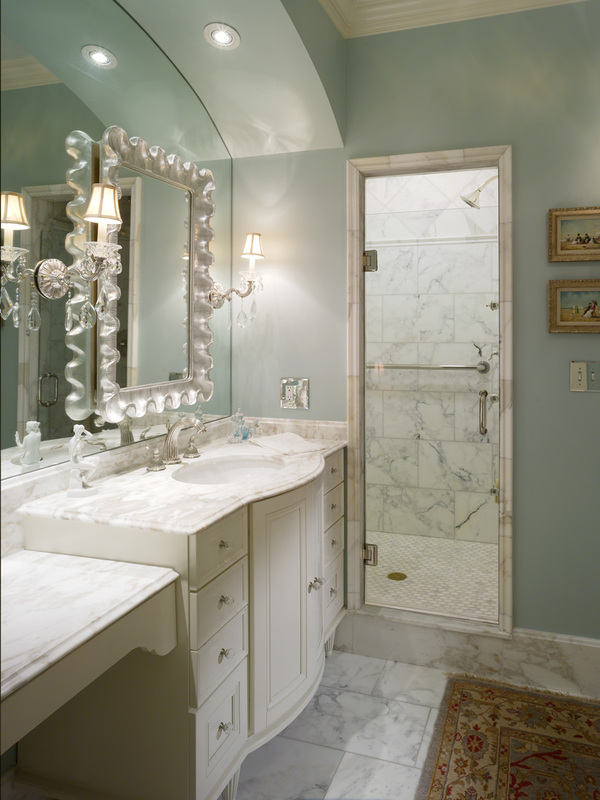 Pale blue walls, marble floors and white wood cabinetry come together to brighten up a spacious bath. In the house are three oil paintings by Massachusetts artist Robert C. Gruppé, including one that hangs over the mantel in the living room. The color green is a common theme throughout, reflective of Cheryl’s love for the color in both interiors and nature. The walls in the Cruickshanks’ family room are made from Pecky Cypress. Green paint lends an air of natural earthiness and is a nod to Cheryl’s love of nature. Carolina Lumber & Supply Co.